As New York City's Board of Elections braced for what they thought might be presidential-year turnout for Tuesday's midterm election, they greenlit the purchase of extra ballots and more poll workers to staff sites across the city. But despite the fact that for the first time ever they would have a two-page ballot—meaning the scanning machines would be doing twice the work for each voter outside of Staten Island—the BOE only upped the number of scanners by 459, or 12 percent, according to a review of the Board’s annual report and a rundown of equipment deployed on Tuesday. 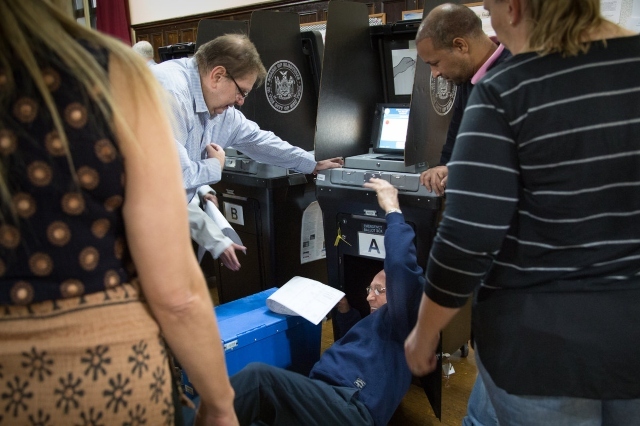 The two-page ballot and the ensuing scanner shortage were the leading factors in a cascading series of Election Day problems, which were exacerbated by the perforated ballots; New York’s archaic state laws; and the rainy, humid weather, which caused some ballots to swell in a way that caused widespread scanner jamming problems, according to the BOE. 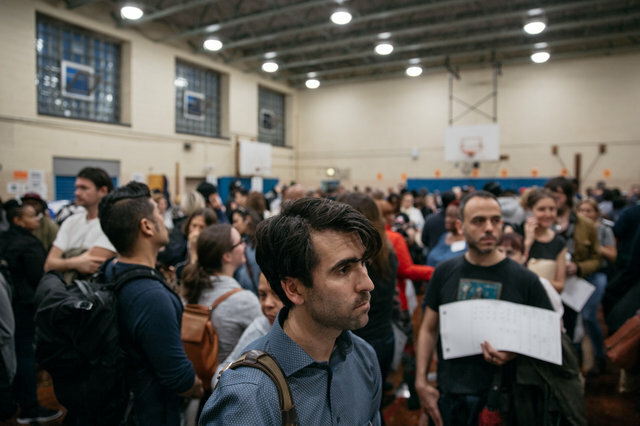 Taken altogether, the problems resulted in an epic logjam at the polling places across the city, the likes of which many New Yorkers said they’d never seen before. When asked why the board hadn’t prepared for all the additional ballot sheets by adequately increasing the number of scanners at poll sites across the city, Ryan deflected, blaming the federal and state laws and a lack of space at poll site. The Board of Elections only got their hands on a final version of the ballot a few weeks before the election, Ryan said. The mayor’s charter revision commission added three questions to the ballot and, according to Ryan, because the state’s election law dictates ballots' layout, ballot questions and candidates can’t be on the same page. The questions were finalized in September, though the public hearing process began in March. Valerie Vazquez, a spokeswoman for the City’s Board of Elections, cited litigation for some candidates on the ballot that had been settled last minute and contributed to the hold up, but declined to comment further. There were hints in the weeks leading up to the election that the two-page ballot was going to cause trouble on November 6th. At an October meeting of the City’s Board of Elections, commissioners voiced concerns about 17-inch long sheets and additional pages getting jammed in the scanners. Ryan described a system where poll workers were supposed to alternate use of scanners on site, for fear that the additional pages would fill the boxes quickly and lead to jam-ups. “If we do the rotation properly, and all the scanners are utilized, [and] we have 50 percent turnout which would be a record for a gubernatorial, we shouldn't have a problem,” he said. The commissioners settled on an increased number of ballots, with no mention of beefing up the number at scanners at poll sites. Election Day came and the troubles began almost as soon as polls opened. Throughout the rainy day, long lines snaked around sweaty gymnasiums and community centers, as voters waited to feed their ballots into scanners. Some scanners had to be taken out of service and there were reports of poll sites down to one or two or even zero functional scanners. Voters described filling out their ballots on the gym floor. Others had to cram theirs into emergency ballot boxes to be counted later, and when those overflowed, images surfaced on social media of ballots stuffed into plastic bags left unattended in the crowded poll place. During the course of the day, the Board of Elections had to replace 56 of its 4,054 scanners citywide, up from 31 in the 2016 presidential election, according to Ryan. It’s not clear how many scanners overall were broken and then fixed by inspectors on site, or how many were simply left out of service. And while 1.9 million people voted, an 88 percent increase from the 2014 midterm elections, nearly a million more people cast ballots in the 2016 presidential elections, with seemingly less issues overall. In the aftermath of the mayhem, City Council Speaker Corey Johnson called for Ryan’s resignation. At a press conference Wednesday morning, Mayor Bill de Blasio stopped short of doing the same. Adding to the shortage of scanners, the rain and average humidity levels of 68 percent contributed to the chaos, according to election experts. The DS200 scanners used by the City’s Board of Elections function best below 50 percent humidity, according to product’s manual. As humidity levels rise, several things can happen that can decrease the scanners’ reliability, according to Joseph Lorenzo-Hall, Chief Technologist at the Center for Democracy and Technology. The ballot paper absorbs moisture and gets thicker, which can cause it to jam more easily. Add to that the fact that the ballot pages were 17-inches long, instead of the size of a regular sheet of paper, which creates an additional hurdle, he said. Beyond the weather, there were additional things outside the board’s control that added to the misery, beyond just the weather, he said, like a New York State law requiring the ballots be printed in a conjoined pad and only separated when a voter is ready to vote. This ends up creating a jagged edge that can actually snag on the scanner when it’s fed in, he explained. And of course, New York is one of the eight states that hasn’t passed election reforms to allow early voting, or no excuse absentee ballot voting. “You guys need to make sure people don’t have to come on a single day to vote or your gonna have problems like this for eternity,” Lorenzo-Hall said.